The UK’s Music of Black Origin (MOBO) awards took place in Liverpool on 3rd November. I didn’t even know they were being televised and have not watched any of the highlights, but I still have an opinion on it! 🙂 When I was younger I would watch the MOBOs EVERY year; but now things have changed. I do admire Kanya King – entrepreneur, businesswoman and founder of the MOBO awards; born in London to a white mother and black Ghanaian father. Kanya has an inspirational story, like 99.99% of Ghanaian parents she recollects her father’s strong belief in ‘education, education, education and discipline’. Despite losing her dad at the age of 13 and becoming a single mother at 16 she did not let what some may see as barriers stop her from achieving great things. Kanya credits her Ghanaian heritage as a catalyst to her amazing work ethic but admitted that it was difficult for her to complete a university degree being a young mum and later was kicked off her course. Despite this she was able to work for a British television network and through that after re-mortgaging her house set up the MOBO awards from her bedroom in 1996. There was an interesting article in the Guardian newspaper that summarised some public opinion towards the MOBOs, so I won’t regurgitate it. However, I will say that winning a MOBO award should only occur if a music act produces credible music within the year being celebrated that is of black origin. MOBO defines this as music originating ‘Gospel, Jazz, Soul, Reggae and Hip Hop’. The MOBOs has been accused of becoming too commercial and I agree to some extent. As mentioned earlier I didn’t watch the awards because I just forgot about it, as I have now become indifferent to them; what they mean or represent. It’s a good platform to showcase British talent but I think the MOBOs should get back to its roots and showcase true music of black origin. That’s all, quite simple, yes?! This was what made it unique when I was younger (hence why I watched it every year) and not just another award show like the MTV, Brit or American Music awards. Don’t get me wrong, there were some deserving winners (like the lady above) but I think the awards have lost their way a bit. I am aware that the world has been gripped by recession and I guess I have to accept that the music industry is a business first rather than a creative vehicle for genuine and unique expression. It’s all about the pounds, euros and dollars! I think UK singer Daley should have been nominated / won an award. I saw him at the Jazz Café London in May and he was really good! ‘We could’ve had it all, rolling in the deep…’ Adele definitely had it all at the Grammys 2012! I have noticed some positive change in the music industry which is refreshing after being fed manufactured music for so long. Emeli Sundaé and Adele have led the British musical scene over the past year. Emeli winning MOBO, Q, Brit awards as well as performing at the Olympics. Adele cleaned up at the 2012 Grammy Awards; both being recognised, not because they walk around half-naked but because they are good at what they do! Having said this, there are still comments about Adele’s weight flying around, even after she graced the front cover of Vogue magazine. To be fair, image is very important in the music industry, as in most creative industries, so I am glad to see that society is starting to think for itself, while appreciating all talent regardless of the shell in which it resides. People are challenging the status quo and not accepting something just because a few executives in a board room have decided on what talent or perfection should look like. This may take some time to percolate because when an ideology has been ingrained, your whole mind-set has to change which is difficult to do. 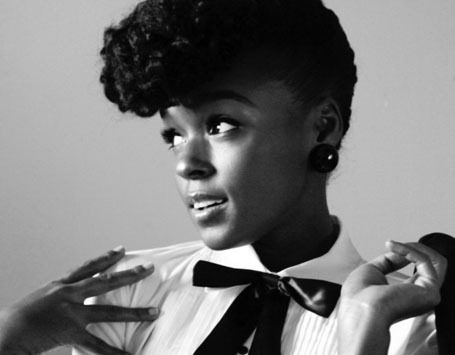 In the words of singer Janelle Monáe (another great performer I was lucky enough to see last year while living in New York – she supported Erykah Badu at the Roseland Ballroom), we should embrace what make us unique even if it makes others feel uncomfortable and remember that perfection is often the enemy of greatness. Spot on Adelina! Jason and I watched the MOBOS I suppose when you get to our age there’s not much else to do! We discussed it at length almost everything you touched on. He has a huge thing about image and weight and thinks as black women we often let ourselves down by not keeping up appearances and looking after ourselves properly his ideal would be for every one of us to actively use a gym membership cos were beautiful and with the right weight and body you can wear a plastic bag and look great! Previous Entry Who needs education anyway?